Subscribe to comments with RSS or TrackBack to '2018 Draft coverage; Mock Draft mania plus my projected top-5 and Nats picks'. Todd – nice write up. I’ve given up my paywall subscriptions so it’s good to know who some of them are saying. Here’s some random observations: In the top picks, I think there is a real chance Singer drops out of the top 10 and who knows how far. Just doesn’t seem like he’s been anything special the last few years. Is see some of these hotshot prep guys going very early, like Wynn, Liberatore, etc. 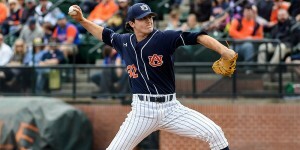 For our pick, I’d like them to concentrate on pitching again, since we are so barren (imo). And I’d like them to go outside the box a bit. A bunch of these guys seems like either middling LHP types or the dime a dozen prep righties, so I’d pass. The ones that stand out to me are Rocker – love the different body type but if he’s lost velo, I’d tread carefully unless I knew why; Denaburg – his command and secondary stuff impressed me but i’ll Bet he’s gone by their pick; Wilcox – for similar reasons, and Hjelle – if harnessed, he could be formidable (but it’s high risk). I’d also like to see them add quality pitching in later rounds too. So . . . I’m looking at Kowar (probably wishful thinking), Beck (better be right on him since he’s senior age [junior status] and would need to move up quickly, like Crowe), Rolison, or Hjelle. I will be disappointed if the Nats go with a HS arm, all the more so an injured one like Denaburg. They can’t wait for someone with a 2023-24 ETA. As for the big boppers, I’d leap all over Beer if he’s there when the Nats pick in the 2d, or Baker if he’s there for the Nats in the 3d. You have to think that at least one from among Beer, Baker, and Conine is going to make it big; my guess would be Beer, who has the best plate discipline among the three. If I were the Nats, I’d actually be tempted to take Beer in the 1st, but they need starting pitching more than hitters right now. With the big club, I’m pretty PO’d with how lethargic the Nats have been in the first two games in ATL. There’s been no sense of urgency whatsoever, no spark. The Braves and their fans are fired up, while the Nats have barely even showed up. Yes, it’s the beginning of June, and there’s still a long way to go. But at least look like you’re trying. Wow, Kershaw made one start off the DL and is now back on it. I don’t agree with your draft philosophy, KW. When the draft rolls around and the reports are written, we tend to forget that the vast majority of these guys never amount to anything. So it’s very hard. If you add the dimension that you want a college, which to the majors type, I think all you do is lower your chances of finding a guy who contributes in the majors. They should just take the best guy on their board. The consequence of trading all those pitching guys is that they’ll be paying up in the FA market for a few years. I’d be glad to debate draft philosophy, but let’s acknowledge that it’s not “mine” alone. It’s also Rizzo’s, and Billy Beane’s, and that of quite a number of other GMs. Yes indeed, “the vast majority of these guys never amount to anything,” and the worst offenders in that category by far are high school pitchers. That’s why Rizzo has only taken three of them in the upper rounds during his decade with the Nats, as Todd chronicled, only one in the first round. So I’m not only predicting what Rizzo will do, I’m also stating why I think they need a college arm who can move quickly through the system. Again, that’s not an original statement from me; I’m just agreeing with the Fangraphs guys. If we’re talking about who I would actually pick, I’d be very tempted to skip the pitchers and go for a Beer. I think he’s the surest thing on the board at #27, even if he’s position-limited. But I also understand the strong case for trying to ID a college starter who can follow Crowe’s lead and finish his first full pro season in AA (assuming Crowe will be promoted soon). If they had hit on both Romero and Crowe last year, this area might not be such a need, but they didn’t, and it is. The only viable “prospect” starters they have with full-season teams right now are Fedde (AAA), Rodriguez (AA), Crowe (A+), and Raquet (A), and I’m not completely sold on J-Rod or Raquet. They have other young starters at Hags who have some promise, but none has stood out yet. I guess we’ll find out how much the Nats believe in them by how much of the top of the 2018 draft they devote to yet more arms. I put my 2 cents in the post about the surprise of hearing from practically everyone that nats are on HS arms. Maybe its because there’s just so many of them in this draft and t hey stand to get decent value. Like always, there seems like there’s going to be quality college friday starters from big schools with big accomplishments available at the end of the first; that’s what i’d take, that’s what I think they should take. Take a guy who can move up and be in the rotation when Gio’s contract ends and keep the train going that htey’ve so depleted in the last two years. So, I watched part of the LSU-Oregon State game last night. Zack Hess (LSU starter, from Lynchburg VA) struggled with his command like he had all year and was knocked out early … and I got to see Luke Heimlich for the first time live. And damn he looks like a pro starter. Dominating stuff. I wonder who is going to roll the dice on him. I don’t know if the Nats would do this, but I would stay away from arms that fall from injury in the first round. Although the Nats have by reputation taken pitchers that fell, how well did Giolito and Fedde turned out? And Luzardo was a first round arm that dropped to third because of TJ. That is very, very different. Dane Dunning was a college starter who was drafted after Kieboom and has had a solid rise and no drama and as much trade value as Giolito. Which is why I would take a player with great power potential who has defensive versatility. Kieboom is the next top prospect of the system once Robles graduates and Soto is full time major league. The Nats system and indeed their team is comparatively short of offensive talent. I get the Romero draft; of a college starter arm that can move quickly (Perhaps we’ll see him at Auburn and then in the A leagues). But it’s hard to envision that at slot 27. To me, the international market is the place to sign the high end high school arms, and for a lot less money. What i would bet on is the Nationals misdirecting the market to protect them for players who fall into the 20’s whom they may grab. The risk of grabbing a falling star for the right reasons is indeed often worth it. And Rizzo never shows his hand. Beware the tournament flash. Drew van Orden was one, and he was quickly out of baseball.